Schwarzenegger tweets about landing, calls it "a little adventure"
LOS ANGELES, California (CNN) -- A plane carrying California Gov. Arnold Schwarzenegger made an emergency landing Friday evening after the cockpit filled with smoke, his office said in a statement. California Gov. Arnold Schwarzenegger called his plane's emergency landing "a little adventure" on Twitter. Schwarzenegger confirmed the incident with a tweet on the social-networking Web site, Twitter. 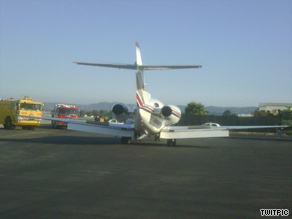 He also included a photo of the jet on the tarmac. "A little adventure just now when my plane made an emergency landing. All's OK, though," he posted. The governor was on his way to the Santa Monica airport after a speech in Mendota, California, about the drought affecting the state. The jet was diverted to Van Nuys Airport after the pilot reported "smoke emanating from the instrument panel in the cockpit," Schwarzenegger's office said, adding that there were no visible signs of a fire. The pilot made a "quick, steep, but safe landing," his office said. No one was injured. Twitter is a social networking site that allows users to update what they are doing using 140 characters or less. All About Arnold Schwarzenegger • Twitter Inc.